The PockeX Pocket is an all in one device that derives its name from its compact carry around size. 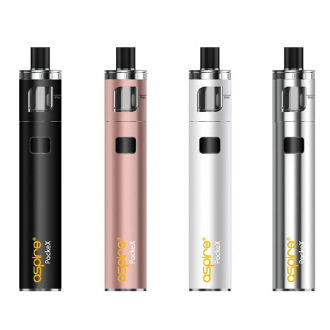 The PockeX Atomizer, unlike most all in one devices, can actually be taken apart. For easy cleaning and maintenance the drip tip, top cap, coil, and Pyrex glass with its stainless steel covering can all be separated. The only piece that can’t is the bottom base which is actually the top of the battery making the entire PockeX a genuine all in one device. Your most important access points are through the top of the clearomizer, including refilling your liquid and changing your coil. The PockeX Pocket is a top filler, and all the user needs to do is unscrew the top cap to pour the liquid down the sides of its glass body. At the same time the user will see the coil attached to the top cap where they can change it without having to dump any liquid out. This kit does come with two coils in 0.6 Ohms. One is preinstalled and the other comes as an extra. The 0.6 Ohm will give the user a fulfilling hit along with plenty of vapor to satisfy. The PockeX Pocket is considered to be a sub ohm device due to its output of 18-23 Watts and its coils being below 1 Ohm. Also included in this kit is a Micro USB Charging Cord. This device has a pass thru feature which means the Vaper can charge and vape at the same time. The feature also insures that you have constant access to a charged e cigarette without having to count the minutes of when you can vape again.